It was a heady time in aviation... In 1956, it seemed as if every week, speed records were being broken in the quest to be the fastest. Supersonic flight, having been achieved only a decade earlier, wrought new challenges to pilots and designers, but also new perils. In 1952, the Grumman Aircraft Engineering Corporation funded a study to possibility of adapting the stock F9F 'Cougar' design with advancements in aerodynamic science, such as adherence to the 'Area Rule', reducing transonic drag and enabling the aircraft to achieve a supersonic performance. By 1953, the resulting aircraft design bore little resemblance to the Cougar, sporting a fully redesigned wing assembly, abandoning the use of ailerons in favor of spoilers to control the roll of the plane, as well as the installation of leading-edge slats to improve low velocity maneuvering, and folding wing for compact storage on naval aircraft carriers. Powered by a Wright J65-W-18 turbojet engine, a British-designed Armstrong Siddeley Sapphire powerplant built under license by Curtiss-Wright Corporation, the airplane was supplied with a surprising 10,500 pounds of afterburner thrust, capable of a speed of just over Mach 1.1 at 35,000 feet. The plane was equipped with four hardpoints for AIM-9 'Sidewinder' Air-to-Air missiles, and armed with four 20-millimeter Colt Mark-12 cannons, capable of firing 125 rounds per gun. On Friday, September 21st, 1956, Grumman test pilot Thomas W. Attridge, Jr., 33, took an F11F 'Tiger', Navy Bureau number 138620, on a test flight over the Atlantic Ocean. A former Navy aviator and a father of three, Tom Attridge was used to flights over the water, and this sortie's weapons test, strafing the ocean's surface, was a relatively simple task., and a great way to end the week. Born in 1923, and the son of a native-Irish New Jersey pastor, a young Attridge graduated from the elite Phillips Exeter Academy in 1942 amidst the war clouds of the Second World War. Going into the Navy, the young Ensign married, and was sent to the Pacific, where he flew Hellcats with Air Group 21 (Fighting Squadron 21 - VF-21), aboard the USS Belleau Wood (CVL-24). In June of 1944, the unit was engaged in air support of ground mop-up operations on Guam, followed by initial strikes on Palau and the Philippines. In October, the unit launched strikes on Okinawa, Formosa, Luzon, and Leyte, and participated in the Second Battle of the Philippine Sea, striking the northern Japanese force, consisting of four carriers, two battleships, and multiple cruisers and destroyers. Flying over the designated gunnery range some 20 miles from shore, out over the Altantic Ocean, Attridge entered a shallow dive from an altitude of 20,000 feet, as he readied to test-fire the Tiger's cannons. He fired a short four-second burst at 13,000 feet, expending about 70 rounds in total. Advancing the engine to afterburners, he paused his fire, and entered into a steeper dive. and fired the cannons again at 7,000 feet to clear the gun belts. Having just finished firing this second four-second burst, the plane rattled. The Tiger had been struck, and Attridge's windshield buckled inward. Having thought maybe he had hit a bird, a typical hazard when flying over coastal waters, Attridge throttled back the engine to 200 knots, and headed back to the field, the Grumman airbase on the Peconic River, near Calverton, New York. He reported to the tower at the Long Island facility that he only sign of damage he could observe was damage to the cockpit glass, and a sizeable gash on the outboard side of the right engine's intake lip. More disturbing, however, was that he could get no more than 78 percent of the engine's maximum available power without the engine starting to run rough. But with only a couple of miles to go, at low altitude and high drag, Attridge concluded that, with his rate of descent, he could not safely reach the airfield. Every time he tried to advance the throttle passed 78 percent, the engine growled its displeasure, sounding like, as Attridge described, "a Hoover vaccum cleaner picking up gravel from a rug." Finally, the engine gave out. A half mile short of the runway, Attridge retracted his Tiger's landing gear, and made a dead-stick crash-landing, ripping through the woods below, shearing his plane's right wing off, and gouging a path of destruction 300 feet long. Fuel ignited, unfired ammunition started poping, and Attridge, having suffered a broken leg, and three busted vertebrate in the post-impact sequence, scrambled out of the doomed craft after cutting himself free of his PK-2 life raft's lanyard. A Sikorsky S-58 helicopter dispatched from the Grumman factory, and piloted by Edwin Cartoski, picked up Attridge amongst the foilage, evenly shearing his rotor blades in the process. Attridge was carried away to receive medical assistance at Central Suffolk Hospital in the nearby town of Riverhead. He later spent two weeks hospitalized after he was relocated to Manhasset, which was closer to his home and family. If the projectiles had been explosive, like those used in combat, Attridge would not have likely survived. "This would be more than 2,000 miles an hour, but their speed was immediately slowed down, because of air resistance. The plane was traveling about 880 miles an hour, better than 100 miles an hour faster than the speed of sound." 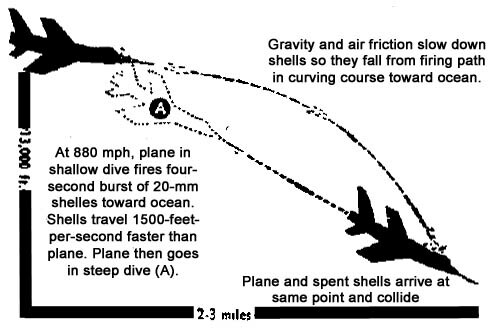 If the airplane had kept its original course, it would have passed by them, but its steepened dive path made it intersect the bullet's down-curving path. When it hit them, they must have been moving so slowly that the airplane overtook them at a good fraction of its own air speed, which was about as fast as many a newly fired bullet. Naval Vice Admiral William V. Davis, deputy chief of naval operations for aviation, told the story of the strange accident at a luncheon talk before the Aviation Writers Association at the National Press Club in Washington, DC, nearly five weeks after the accident. As a result of the accident, the Navy advised pilots of its fast jets to turn off course or pull up after firing their guns, despite claims by them that it was a "million-to-one shot." But Attridge disagreed. "At the speeds we're flying today, it could be duplicated any time." Attridge continued his work with Grumman, returning to flight status less than six months later. Afterwards, he would become the project manager for LEM-3 - the first lunar module rated for human flight. It flew as "Spider" with the crew of Apollo 9. He would also go on to become vice president of Grumman Ecosystems, the company's environmental management and research venture, which resulted in advances that resulted in the digital camera. He passed away in 1997. On June 20th, 1973, Pete Purvis, a test pilot for Grumman, was flying out of Point Mugu, California, in an F-14 Tomcat, when his plane was hit by its own AIM‑7E 'Sparrow' missile. The missile had pitched up during launch and punctured the plane's fuel tank. After losing control of the aircraft, both Purvis and his systems officer, William Sherman, ejected successfully and survived.